MacArthur Causeway (Florida A1A) extends east from Interstate 395 to span the Intracoastal Waterway (Biscayne Bay) between Museum Park and Watson Island. Photo taken 07/26/17. 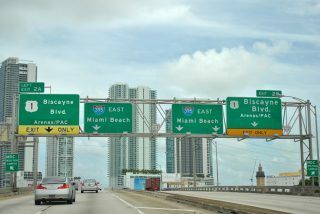 The shortest spur freeway in the Florida Interstate system at 1.29 miles, Interstate 395 provides an essential link between Miami at Overton and Miami Beach. Extending the Dolphin Expressway (SR 836) east from the Midtown Interchange with Interstate 95 (North-South Expressway), I-395 travels an elevated route east to SR A1A (MacArthur Causeway) across Biscayne Bay. The freeway doubles as SR 836. I-395 also comprises part of a truck route to the Port of Miami with its connection to the SR 887 (Port Miami Tunnel). Providing direct access to the port from MacArthur Causeway on Watson Island, the $668.5 million twin-tubed tunnel opened to motorists on August 3, 2014.1 SR A1A continues east along MacArthur Causeway to 5th Street in Miami Beach. Major improvements for Interstate 395 previously scheduled to start in December 2017 will completely rebuild the entire viaduct and ramp system between the Midtown Interchange and the Intracoastal Waterway bridge. The westbound lanes will shift slightly north onto a new footprint, with a signature span crossing above U.S. 1 (Biscayne Boulevard). 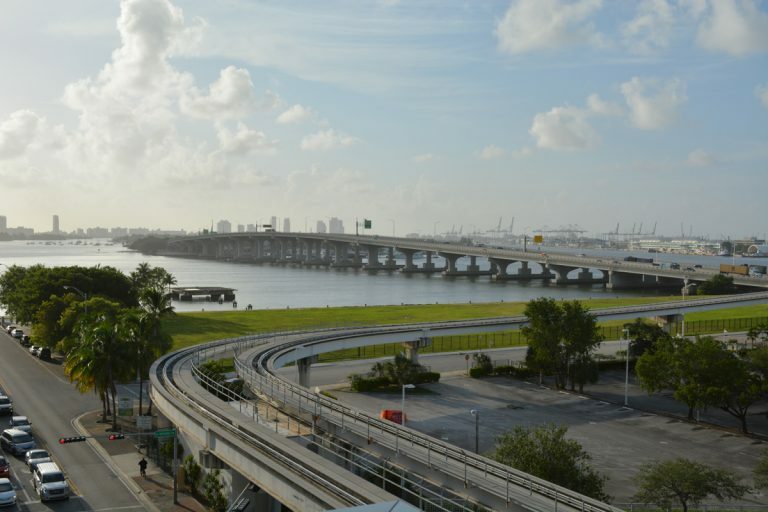 The 1,025 foot bridge over Biscayne Boulevard will feature six sweeping arches, and a significantly higher vertical clearance then its predecessor. Interstate 395 under construction in 1970. 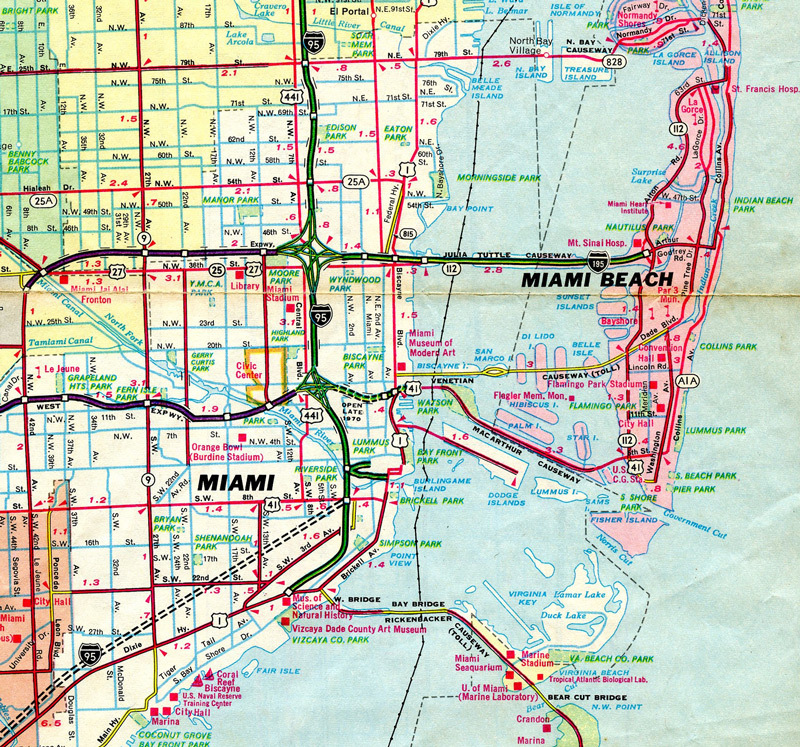 U.S. 41 formerly extended east from Downtown Miami onto MacArthur Causeway from U.S. 1 (Biscayne Boulevard) to Miami Beach. Two roadways carry traffic along Interstate 395 east near the ramps to U.S. 1. Traffic transitioning directly from Florida 836 utilizes the inner roadway to U.S. 1 (Exit 2A) while motorists from nearby Interstate 95 use the outer roadway to Exit 2B. The two ramps lower to street level at NE 2nd Avenue, one block west of U.S. 1 (Biscayne Boulevard). Photo taken 07/05/11. Updated signage at the same location adds the Port of Miami as a destination. Florida 887 branches south east from the Intracoastal Waterway bridge along MacArthur Causeway to the port while Florida A1A continues east toward Miami Beach. Photo taken 04/04/15. The on-ramp from the Port of Miami Tunnel (SR 887) merges onto the left-hand side of SR A1A (MacArthur Causeway) as traffic crosses the Intracoastal Waterway. SR A1A ends at forthcoming Exit 2 with U.S. 1 (Biscayne Boulevard), while Interstate 395 and unsigned SR 836 begin. Photo taken 04/04/15. Replaced guide signs at the westbound beginning of I-395 during construction for the Port of Miami Tunnel (SR 887). A Metrorail line passes overhead as Exit 2 departs for U.S. 1 (Biscayne Boulevard) and NE 13th Street. Advance signs for the Midtown Interchange (Exits 1A/B) were added here in place of this pull through panel for SR 836 west. Photo taken 03/04/14. Exit 2A departs for U.S. 1 (Biscayne Boulevard) from the inner roadway of Interstate 395 east. Traffic continuing straight enters the MacArthur Causeway across Biscayne Bay. Photo taken 07/05/11. Interstate 395 and unsigned Florida 836 come to an end as the roadways merge over NE 2nd Avenue and U.S. 1 (Biscayne Boulevard) below. Florida A1A will join ahead and cross over the MacArthur Causeway to the Port of Miami and Miami Beach. Photo taken 07/05/11. An overhead directs motorists along U.S. 1 (Biscayne Boulevard) north to turn left onto NE 12th Street, two blocks south of Interstate 395, for the freeway west to I-95 and SR 836. Photo taken 07/26/17. An on-ramp joins U.S. 1 (Biscayne Boulevard) north with SR A1A (MacArthur Causeway) east as it overtakes the ending I-395 out to Watson Island and Miami Beach. Photo taken 07/26/17. Trailblazers for Interstates 95 and 395 posted along U.S. 1 (Biscayne Boulevard) south ahead of the MacArthur Causeway viaduct linking SR A1A with I-395 west. An on-ramp joins the freeway from NE 12th Street, a block west of U.S. 1. Photo taken 07/26/17. The I-395/SR 836 reconstruction project will shift the westbound freeway northward and provide separate ramps for both the the continuation of I-395 west to the Dolphin Expressway, and for the distributor roadway to Interstate 95. Photo taken 07/26/17. Older guide signs along U.S. 1 (Biscayne Boulevard) for Interstate 395 omitted the designation in favor of Florida 836. This overhead at NE 12th Street was replaced after June 2011 to include I-395. Photo taken 03/26/06. Replaced overheads along NE 12th Street preceding the separate on-ramps for I-395 west. Both ascend onto the freeway viaduct ahead of the Midtown Interchange. Photo taken 03/26/06. Interstate 395 angles northwest from NE 1st Avenue and the Overton community to Exits 1B/A for Interstate 95. Sign changes made in 2014 reflect the conversion of SR 836 west into a toll road; t Dolphin Expressway was previously tolled in the eastbound direction only. Photo taken 04/04/15. Reconstruction of the Midtown Interchange will combine both movements to Interstate 95 into a single departure from a distributor roadway starting back above NE 1st Avenue. Presently back to back off-ramps depart for I-95 to Fort Lauderdale and Downtown Miami respectively. Photo taken 04/04/15. A left-hand ramp Exit 1A) leaves the west end of Interstate 395 for I-95 south toward Coral Gables as the freeway mainline transitions into the tolled Dolphin Expressway (Florida 836). Florida 836 passes to the south of Miami International Airport (MIA) en route to Sweetwater and the Homestead Extension of Florida’s Turnpike. Photo taken 04/04/15. Interstate 395 west concludes ahead at the Midtown Interchange with I-95 and SR 836 west. SR 836 continues westward along the Dolphin Expressway to SR 826 (Palmetto Expressway) and the Homestead Extension of the Florida’s Turnpike (unsigned SR 821). Photo taken 03/04/14. Entering the multi-level systems interchange (Exits 1B/A) with Interstate 95 on I-395 west. Two lanes of traffic departed for I-95 north to Fort Lauderdale, followed by a left ramp for I-95 south in 0.25 miles. Photo taken 04/01/14. 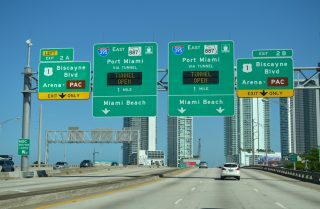 With the conversion of the Dolphin Expressway to all electric tolling (AET) in 2014, sign changes were made for the left-hand ramp to Interstate 95 south reflect the last exit before toll. This ramp will be removed and replaced with a new flyover from the right as part of the I-395 / SR 836 reconstruction project. Photo taken 03/04/14. Florida 836 and the Dolphin Expressway rises over NW 17 Avenue and the Miami River en route to the Midtown Interchange with Interstate 95 and 395 in 1.1 miles. Photo taken 07/05/11. The Dolphin Expressway crosses U.S. 441 (NW 7th Avenue) as it reaches the stack interchange with I-95 & 395. Interstate 395 leads motorists east toward the Port of Miami and Miami Beach while I-95 south heads to Downtown Miami. Photo taken 07/05/11. A single lane ramp leaves for Interstate 95 south toward Downtown at the Midtown Interchange. A separate ramp will depart for NW 8th Street on the approach to the I-95 mainline. Downtown Miami lies one mile to the south of the stack interchange. Photo taken 07/05/11. Traffic to I-95 northbound departs from a left ramp as drivers continue east to Interstate 395 to Miami Beach. 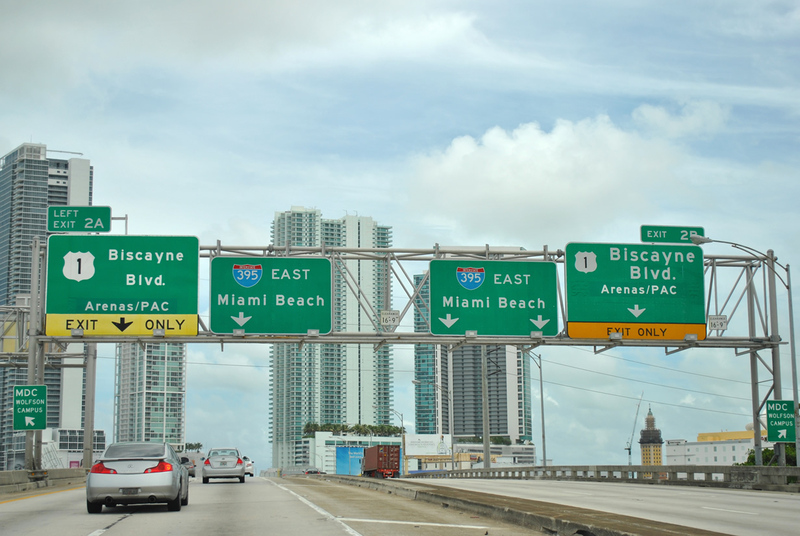 Florida 836 will silently follow I-395 to its end at Exit 2A to U.S. 1 (Biscayne Boulevard). Photo taken 07/05/11. Interstate 95 south widens to seven lanes on the approach to the Midtown Interchange with Florida 836 west to Miami International Airport (MIA) and I-395 east to Miami Beach. Photo taken 04/01/14. Traffic departs via a two lane ramp for Exit 3A to Florida 836 west as two lanes prepare to exit left for Interstate 395 east. State Road 836 follows the Dolphin Expressway from I-95 to State Road 826 (Palmetto Expressway) and the Homestead Extension of the Florida’s Turnpike. Photo taken 04/01/14. Interstate 95 advances south with three through lanes as the left ramp (Exit 2D) for I-395 east leaves. I-395 continues along the final leg of the Dolphin Expressway to Florida A1A (MacArthur Causeway) and the Port of Miami via Florida 887. The succeeding southbound off-ramp from I-95 leads to NW 8th Street while the freeway continues south to Downtown and its conclusion at U.S. 1 in 3.2 miles. Photo taken 04/01/14. Back to back off-ramps depart for Interstate 395 east (Exit 2D) to Miami beach and Exit 3A for Florida 836 (Dolphin Expressway) west to MIA Airport. The Dolphin Expressway runs adjacent to NW 12th Street for its 13.7-mile duration west to NW 137th Avenue. Photos taken 04/04/15. Passing over NW 5th Street, I-95 north nears the multi-level interchange with Interstate 395 east to Miami Beach (Exit 2D) and Florida 836 west to Miami International Airport (MIA). Photo taken 04/04/15. Traffic from Interstate 95 north and south to I-395 east combines along a separate roadway independent of the roadway linking Florida 836 (Dolphin Expressway) east with MacArthur Causeway. I-395 ends at the entrance to the Port of Miami tunnel (Florida 887), which opened in August 2014. Photo taken 04/04/15. PortMiami Tunnel. Florida Department of Transportation (FDOT), project web site. “Jan. 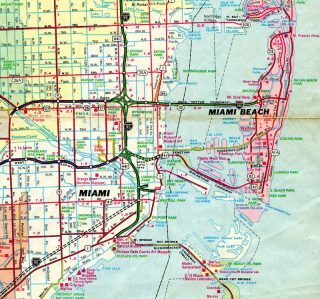 20 Marks End Of The Expressway Era, Transportation Age Must Begin.” The Miami News, January 7, 1969. “First car on finished X-way – too early.” The Miami News, March 26, 1971. “Plan to raze I-395, build anew gains momentum: High-powered committee seems on verge of first step.” Miami Herald, July 9, 2003. “Record of Decision I-395 Reconstruction.” Florida Department of Transportation, July 16, 2010 (Document). I-395 Reconstruction Project Fact Sheet. FDOT.